The Good: This food is very low in Saturated Fat and Cholesterol. It is also a good source of Dietary Fiber, Protein, Thiamine, Niacin and Phosphorus, and a very good source of Vitamin A, Vitamin C, Vitamin K, Riboflavin, Vitamin B6, Folate, Calcium, Iron, Magnesium, Potassium and Manganese. The bad: This food is high in Sodium, and a large portion of the calories in this food come from sugars. 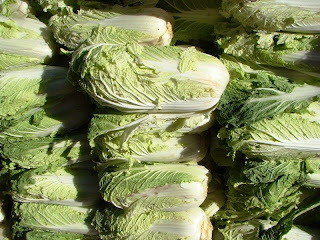 • Chinese cabbage has anti-inflammatory properties. .